It is dawn and Hee-Jin is half-asleep, half-awake. She notices Boong-Do wordlessly watching her, standing by the doorway, and she smiles at him. (Does this man ever sleep?) The camera pans to two coffee mugs, standing side by side on the nightstand. Hee-Jin falls back asleep. The sun is shining brightly outside and Hee-Jin wakes up fully. She looks next to her on the bed but no one is there. She bolts up and searches for Boong-Do. She walks out into the living and throws a little tantrum that Boong-Do seems to have left without telling her. She comes back into the bedroom and finds a note on the nightstand. It is written in Hanja (Chinese characters). She can read her name but the rest, no idea. Hee-Jin notices something in her pocket and she pulls it out. It is the amulet. She hears Boong-Do’s voice outside. 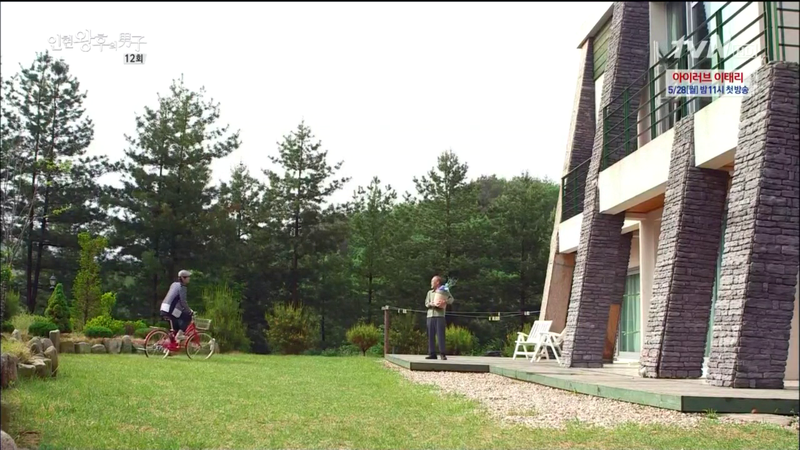 Boong-Do is outside riding a bike, asking the guesthouse owner if he is riding the bicycle well. The owner replies that he riding that well only after one to two hours of practice. 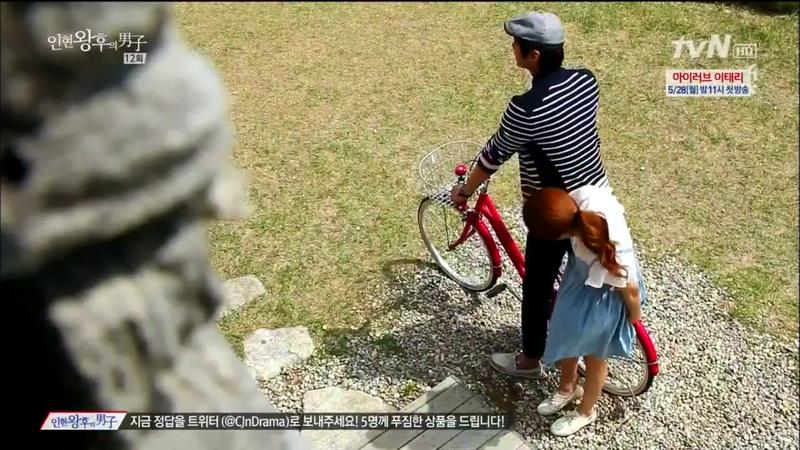 Hee-Jin steps out onto the balcony and looks down at Boong-Do who is circling the yard on a cute red bike. Boong-Do notices her and asks, “You finally woke up.” But Hee-Jin warns that he is going to fall and Boong-Do crashes into the deck. But his long legs touch the ground first and he avoids a complete embarrassment. 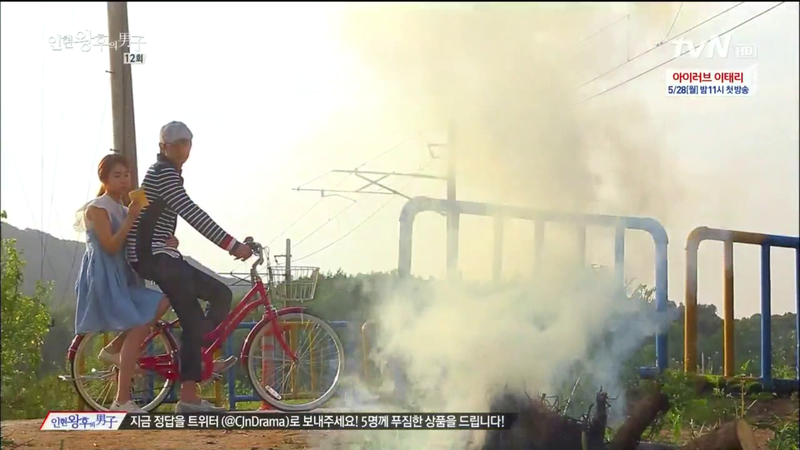 Hee-Jin asks where he got the bicycle. Boong-Do borrowed it from the owner. He was bored waiting for her to wake up so he figured he should try to learn how to ride the bicycle. Hee-Jin bashfully explains that she likes to sleep-in in the mornings. Boong-Do asks Hee-Jin if she is not hungry. He is about to faint from waiting for her to wake up. 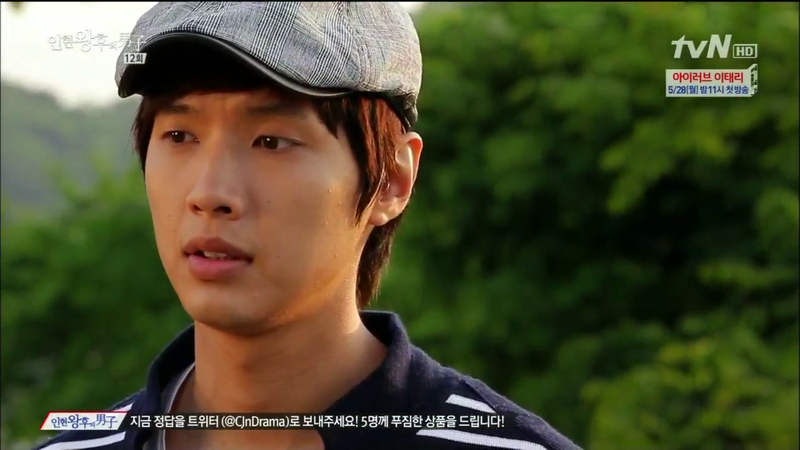 Hee-Jin tells him that he should have woken her up. He asks her what she wants to eat. He will go buy it. Hee-Jin wants to go with him but Boong-Do insists he can go alone. 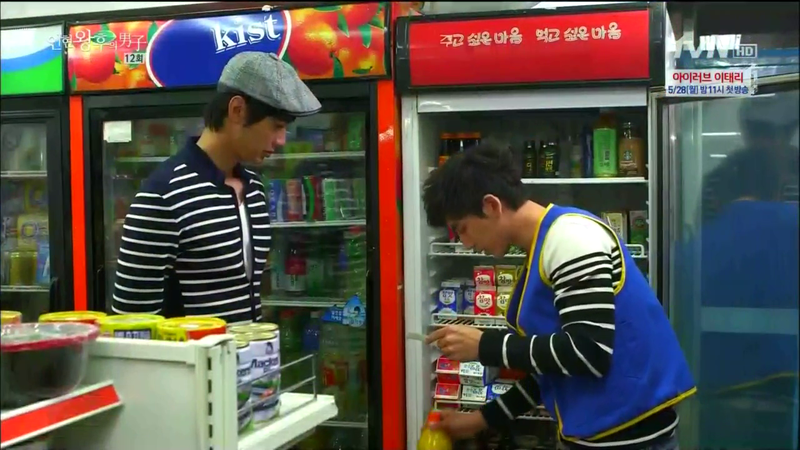 Hee-Jin knows that he doesn’t have any money to buy food so she needs to go with him. Boong-Do pulls out a load of cash from his pocket. (Lesson 6: Never use a wallet. A handful of bills showcases your wealth much better). 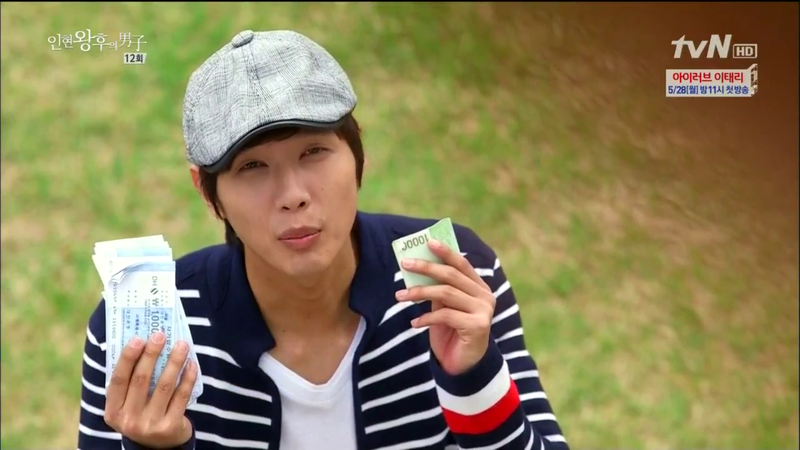 “I have so much money and I don’t have anywhere to put it.” Hee-Jin knows immediately where he got the money. She asks, “When did you sell it again?” Boong-Do informs her that it was easier the second time. Boong-Do informs Hee-Jin that he got a better deal this time. “If I sell it a third time, I think I will be able to get even more. I thought maybe I should buy you a car again but since you already have one….” Hee-Jin shakes her head. She doesn’t want a car that just disappears when you wake up one day. She will just remember Boong-Do’s heart. 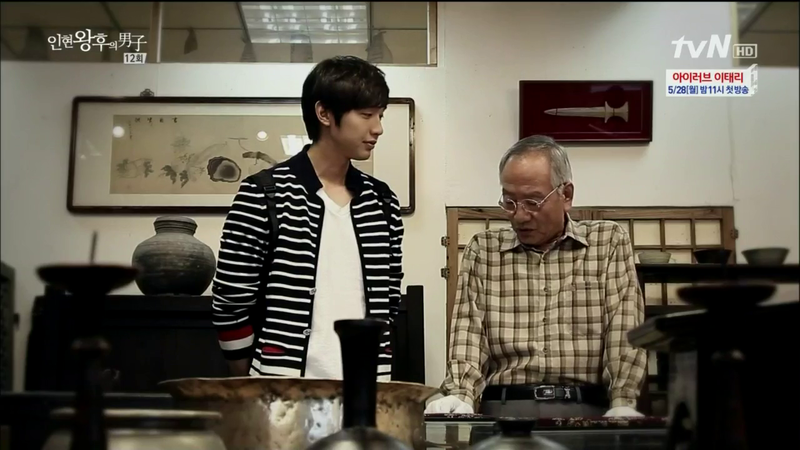 Boong-Do wants Hee-Jin to list the things he should buy and Hee-Jin starts to rattle off. But she stops and heads back inside. Hee-Jin sits at the coffee table, pen and paper in hand. She mutters, “Who are you calling dumb?” Hee-Jin heads downstairs and hands Boong-Do the paper. She instructs him to just buy everything on the list. 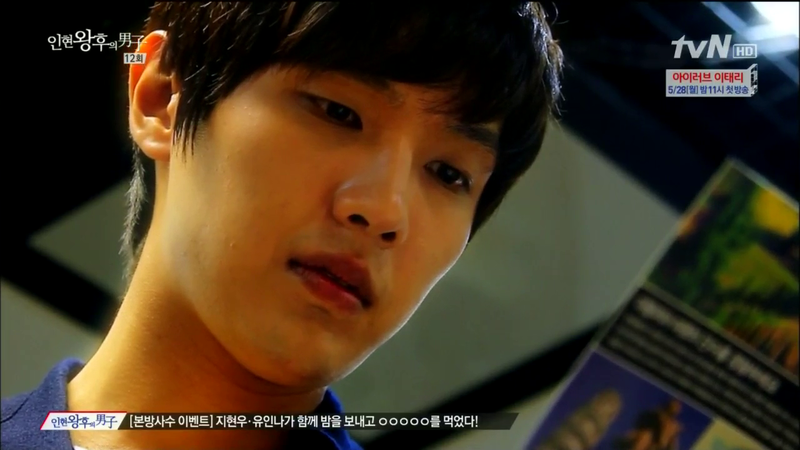 As Boong-Do continues to look at the list, Hee-Jin informs him that he won’t understand what is on the list. It is written in English. English is trendier than Hanja right now. Boong-Do doesn’t need to try so hard to read it. All he has to do is hand it to an employee at the supermarket and they will find everything for him. Boong-Do smiles and puts the list in his shirt pocket. Hee-Jin continues to tease him. “I’m so worried. You don’t even know the alphabet.” Boong-Do just rides off. Dong-Min had been trapped inside the shower stall until Soo-Kyung and Chun-Soo got home. Dong-Min had left in a foul mood. Hee-Jin apologizes. She couldn’t lie. Hee-Jin continues to apologize and Soo-Kyung explains that Dong-Min think Soo-Kyung knew Hee-jin was cheating and covered everything up with a story about counseling sessions. Hee-Jin proceeds to show Boong-Do her amazing cooking skills. 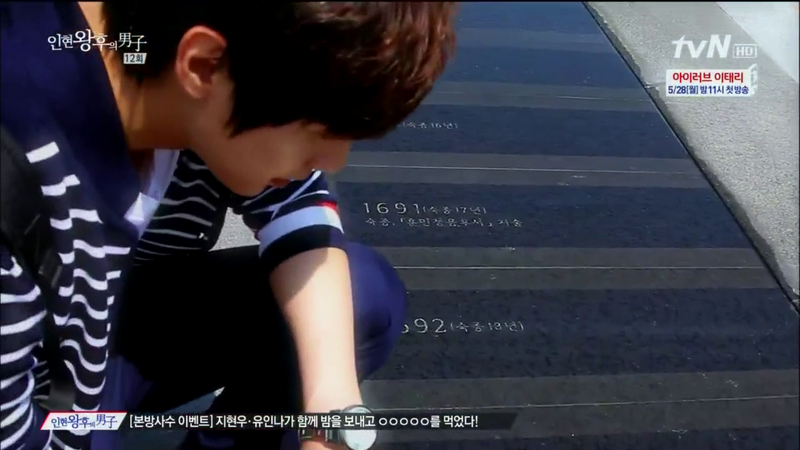 Hee-Jin: “See this line here? You have to make sure to tear exactly at this line. If you go just a little out of the line, you’re ruining the meal.” Boong-Do keeps his eye on the bag as Hee-Jin tears the container with great effort. 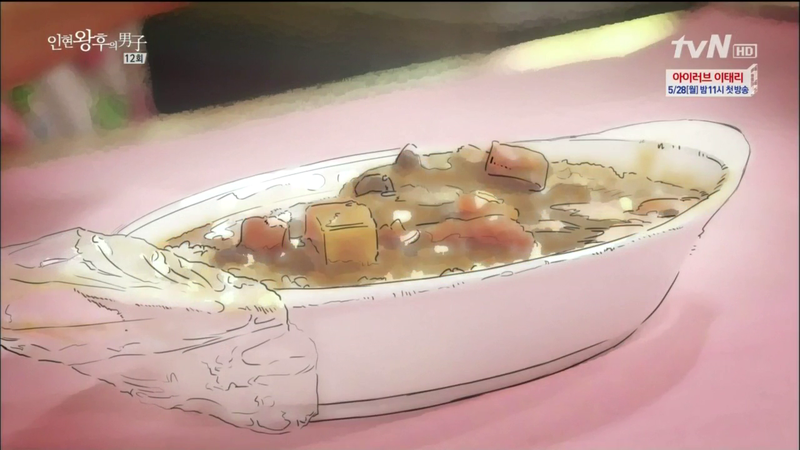 Pour the curry on top of the rice. Put everything into the microwave and heat for 3 minutes. Boong-Do sits seriously with his arm crossed, waiting. The microwave bell chimes and he perks up. Hee-Jin wipes her forehead and with grand gestures, takes out the rice and unwraps it. Voila- It’s perfect! Hee-Jin is surprised at the word “con.” Boong-Do reminds her that he has known this world for several months now. “How dare you?” Hee-Jin laughs and sticks out her tongue at him. “Merong.” (Lesson 11: Con, trick, and prank all you want because you will get nothing but huge smiles). Before they can dig in, Hee-Jin asks what Boong-Do was doing at dawn. He was up, all dressed, and standing at door. Boong-Do asked her if she was dreaming. Hee-Jin is sure it wasn’t a dream. Did he go somewhere at dawn? Boong-Do turns the conversation around but Hee-Jin remains suspicious. Dong-Min is on the drama set, still mad as hell. He sits next to Na-Jeong who asks him if he had fun yesterday. Dong-Min tells her to buy him a drink after they finish filming. Na-Jeong wants to know why he is asking her. What kind of scandal does he want to create? The director comes into the room and Dong-Min approaches him. “I have a good idea. Why don’t have In Hyun Wang Hoo drink the poison and die? I think it will become a big issue.” Na-Jeong reassures the director that it wasn’t her idea. Dong-Min confirms. “It is my idea.” Dong-Min says the same thing he said before the cutting of the amulet changed the course of the future, when Dong-Min had embarrassed himself on the airplane. The director says the exact same things as the last time. To kill of his previous wife would make the King a psycho. Na-Jeong asks Dong-Min, “Did you guys fight?” Dong-Min tells Na-Jeong that she definitely has to buy him a drink. Dong-Min is in the van throwing a temper tantrum and Chun-Soo yells at him for making a fuss here on set. Dong-Min informs Chun-Soo that he can’t film in this mood. Boong-Do looks at her in relief as Hee-Jin sticks out her tongue. Silence falls heavy on them before Hee-Jin says, “You DID really get scared. That you couldn’t return.” Hee-Jin looks crestfallen and Boong-DO is silent. Hee-Jin says, “You know that I am impulsive. Take this before I really burn it.” Boong-Do slowly takes the amulet from her and Hee-Jin looks disappointed. Boong-Do gets back on the bike. Hee-Jing gets a call from a drama’s assistant director. The assistant director wants to know if Hee-Jin can film tonight since Dong-Min is in the hospital and the schedule got changed. Hee-Jin is surprised to hear this. Soo-Kyung gets a call from Hee-Jin. Hee-Jin is calling to confirm that Dong-Min really went to the hospital because of gastric camp, due to stressed caused by her. Soo-Kyung doesn’t think so. She thinks Dong-Min is putting on a show. Soo-Kyung lays it out for Hee-Jin. 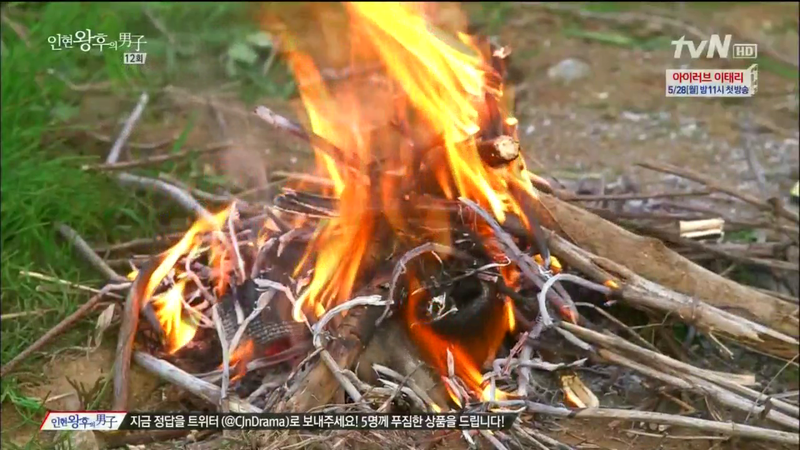 Dong-Min’s insides are all twisted up now because he can’t endure being dumped even though he can dump people. Because of his pride, they don’t know what he will do next. It seemed like the director got a hint that something is going on between Dong-Min and Hee-Jin so she is going to see him right now. Hee-Jin decides that she needs to go the hospital. 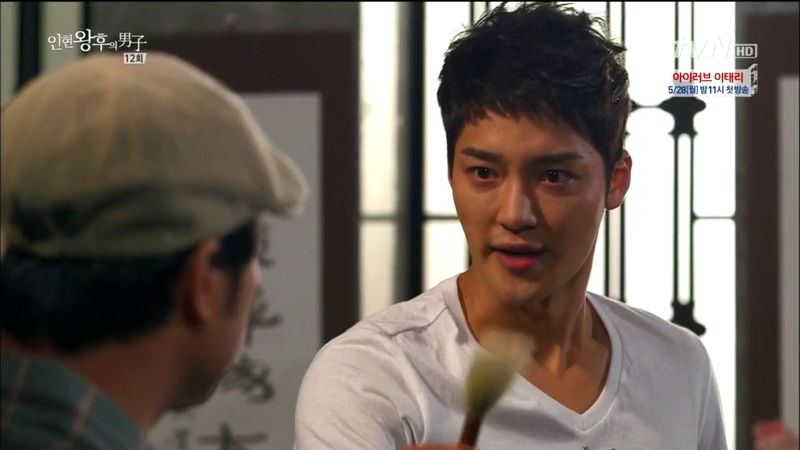 Boong-Do calls Hee-Jin’s attention with his bicycle bell. She informs him that she needs to go. Boong-Do overheard her talk about the hospital and guesses that Dong-Min is there, putting on a show of being sick. Hee-Jin feels she needs to go since she is the cause. Boong-Do doesn’t think Dong-Min is the type of person to get sick because of things like this. Hee-Jin asks how he knows. She thinks Boong-Do is jealous of her going to visit Dong-Min. Boong-Do retorts, “Impossible.” Hee-Jin DOES think it is jealously but reassures him that it will only be a short visit. Boong-Do should not worry and wait for her. Back in Joseon time, Yoon-Wol is leaving Boong-Do’s house with her maid. A man is sitting outside watching this. The same man reports to Ja-Soo that Boong-Do is said to have gone to Yang-Ri and doesn’t know how long he will be gone. Ja-Soo doesn’t think Boong-Do went there. Ja-Soo asks another guy where Boong-Do’s hometown is. It is Chung-Poong. Ja-Soo figures out that if the lie to make sense, Boong-Do cannot appear back in the capital for five days since that is how far Chung-Poong is. Ja-Soo notes that the Queen is visiting her parents’ house tonight. He remembers what Minister Min instructed. They are to wait for the Queen to leave the palace and they must not let Boong-Do enter the palace on that day. Ja-Soo is happy that the heavens seem to be on their side today. He instructs one man to go down to Boong-Do’s hometown and the other man to gather more soldiers. Ja-Soo and the others will go to the Queen’s parents’ house tonight. 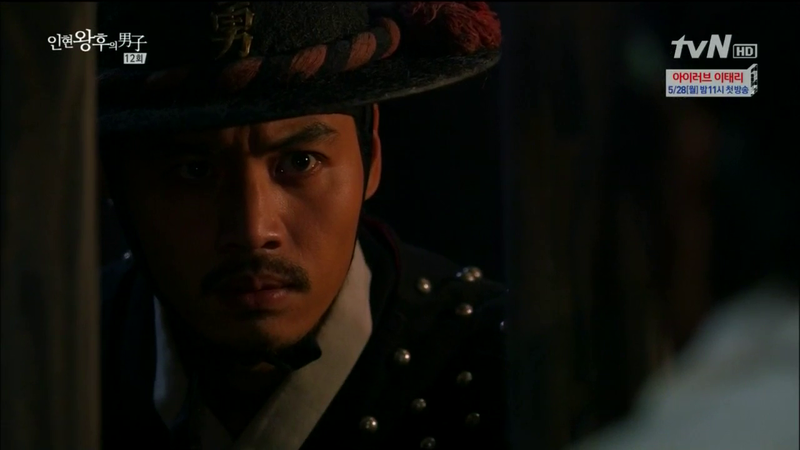 One of the men tells Ja-Soo that he thought about just killing Yoon-Wol who was on her way to the temple unguarded. Ja-Soo tells him to leave her alone. She was a favorite of Minister Min before and Min will deal with her his own way when everything is solved. Dong-Min is in the hospital. Chun-Soo is on the phone with Hee-Jin and informs Dong-Min that she is downstairs. Dong-Min allows her to come up to see him. Chun-Soo warns Dong-Min to not create trouble at the hospital. Dong-Min remembers something and scurries to the bathroom. Hee-Jin tries to calm Dong-Min down. “I’ll explain why the situation is like this even though I didn’t lie or cheat.” Dong-Min doesn’t believe her. Chun-Soo tries to ease the situation but the director has his suspicions and looks at Hee-Jin. The director says to Dong-Min that he looks well. Dong-Min denies that he is well. Dong-Min refuses to film with In Hyun Wang Hoo from now on. He wants all those scenes cut out. He can’t act with a cheating In Hyun Wang Hoo. He can’t pretend to be in love with her. Chun-Soo tries to calm Dong-Min down but Dong-Min continues to insist he can’t work with someone who can’t take care of her personal life. The director is astounded. Dong-Min points to Hee-Jin and calls her a two-timer and a pretentious liar. 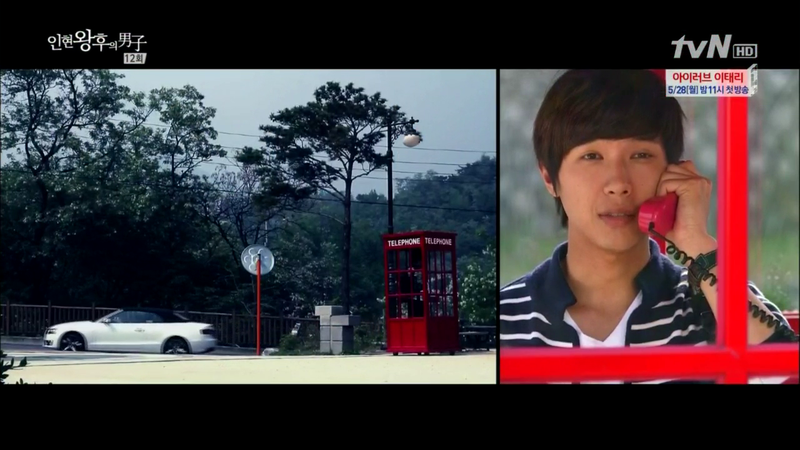 Hee-Jin and the director are outside and Hee-Jin apologies. The director doesn’t know whom to believe but knows he will have to shoot the two of them apart for the time being. Yoon-Wool has come to see Young-Myung monk to confirm for him that Boong-Do had returned safely that night. She was worried that since the monk only received a letter of confirmation, he would still be uneasy. 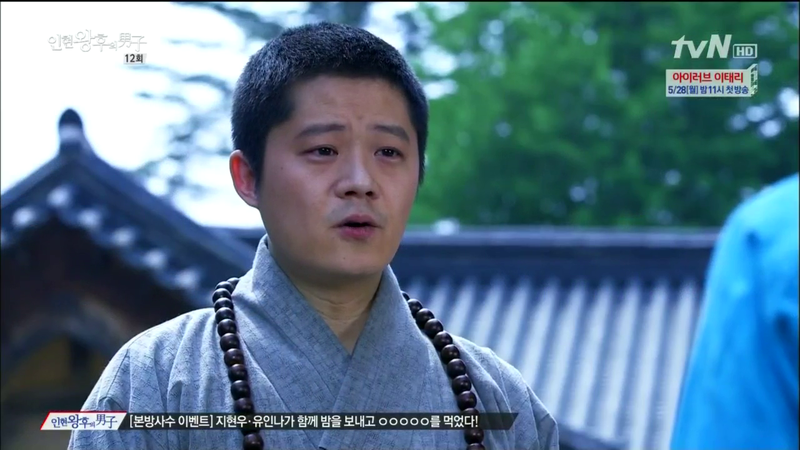 The monk reassures Yoon-Wol that he saw Boong-Do safe, face-to-face. Boong-Do came at dawn. The monk and Boong-Do talk. Boong-Do came to the temple because he couldn’t sleep. 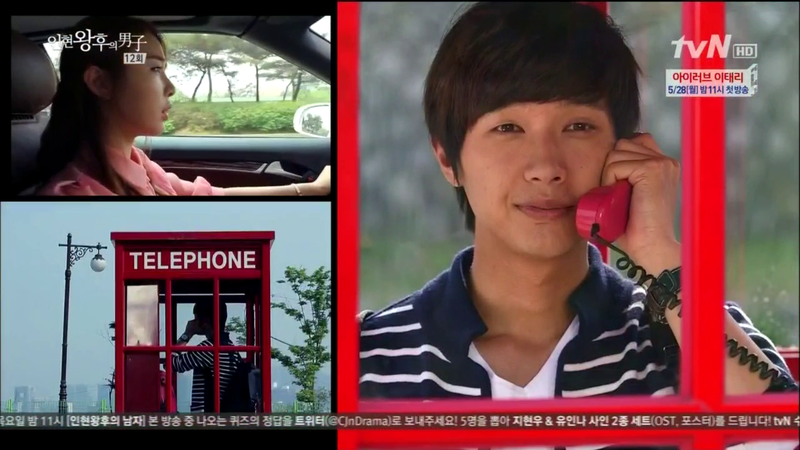 Hee-Jin is driving when she gets call. It is Boong-Do and he is at the park again. He was touring Seoul while waiting for her. Hee-Jin is upset that she worried when he out having fun. Boong-Do asks if anything happened to her. Did Dong-Min do something? 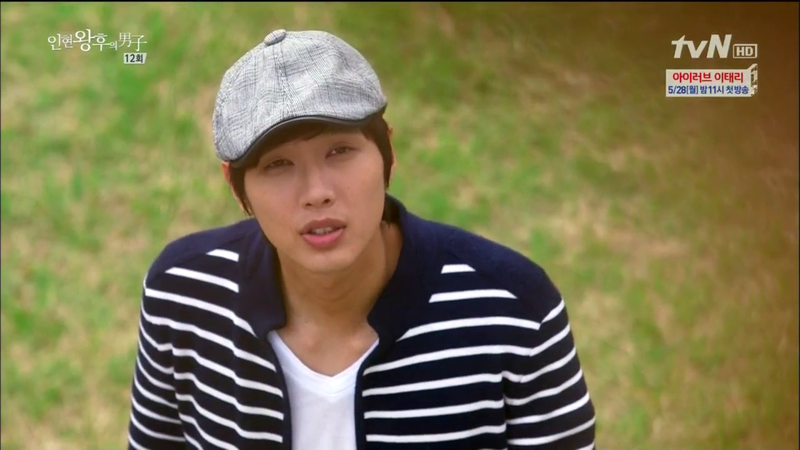 Hee-Jin just tells him that she is not the type of person to just let people attack her. Boong-Do thinks Hee-Jin is exactly that kind of person. Boong-Do: To take real responsibility is to always be by your side. 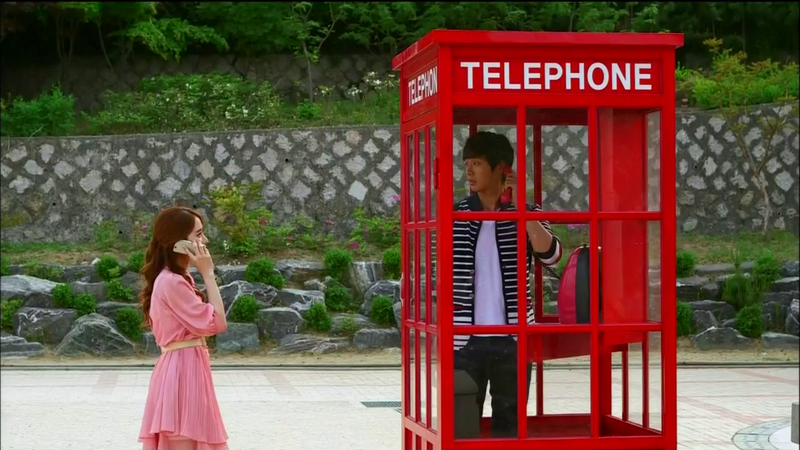 Hee-Jin had been walking slowly to the phone booth all this time and now she is finally in next to it. Boong-Do cannot see her yet. He continues to say, “How is that? I could only think of that solution.” When Hee-Jin remains silent for a long time, Boong-Do finally turns around and sees her. 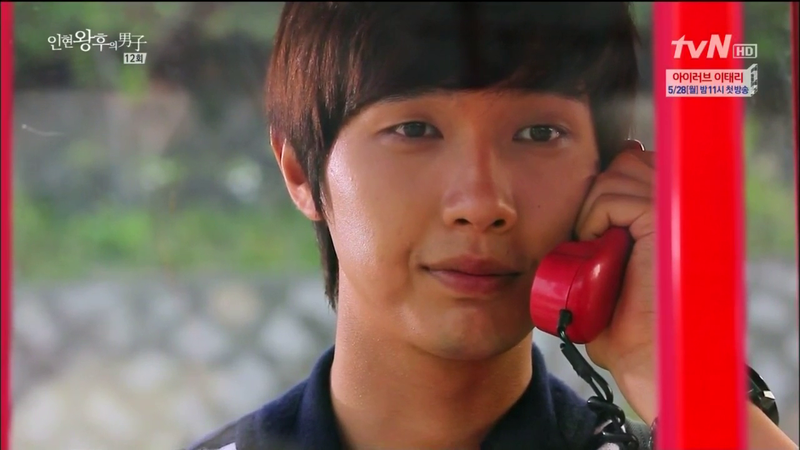 Boong-Do tries to hang up the phone but Hee-Jin starts to speak. Boong-Do puts the phone to his ear again. Hee-Jin says, “That’s a wonderful solution.” Boong-Do asks, “Is that so?” She nods. “I sure know how to pick a person.” They smile at each other through the phone booth. We cut away to what happened between Boong-Do and the monk the night before. The monk asks what worries Boong-Do. Boong-Do tells him he just ran straightforward trying to save his life and help the Queen. Now that everything has been solved and his memories are back….This place he is living in right now has become the past to him. Can he live well in this world? Yoon-Wol asks the monk if Boong-Do really does want to leave here. The monk replies that it isn’t a decision easily made but it seems his heart is already pointed in that direction. Ja-Soo and the others are hurriedly making their way to the Queen’s parent’s house. 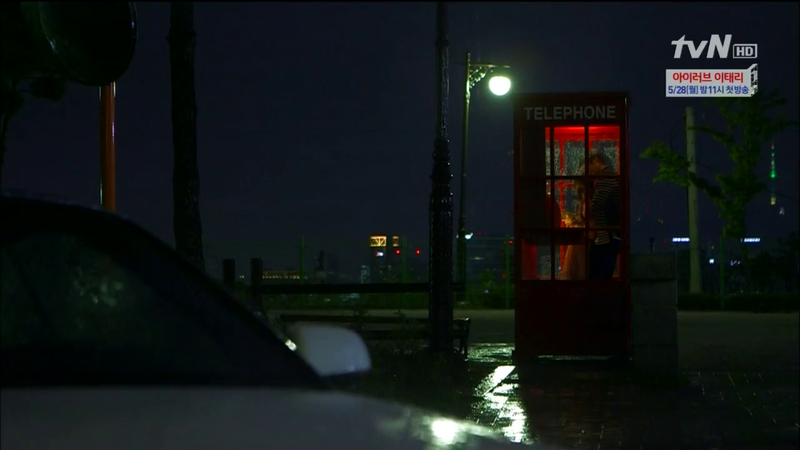 It is evening and Boong-Do and Hee-Jin are still inside the phone booth waiting for the rain to stop. (Who am I kidding? They are not waiting for the rain to stop. They just want any excuse to be as close to each other as possible.) They are looking at the European tour book that Boong-Do saw at the bookstore. He tells Hee-Jin that when he saw the picture of the cathedral, he wanted to go there. Hee-Jin teases him that he can’t travel since he doesn’t know English. “I guess I have to be your translator.” Boong-Do replies, “I think after one month of learning English, I will be better than you.” Hee-Jin can’t believe his confidence. She learned English for years. Boong-Do says that they can even bet on it. Hee-Jin wants to know where he got his confidence. Boong-Do asks her what the spelling of “curry” is. Hee-Jin replies, “c-a-r-r-e.” Boong-Do laughs and says, “See.” Hee-Jin insists that she is right. I said it was perfect. I will take responsibility for those words. “How” you say? By giving you detailed recaps. I might die doing them but I have learned a lot from Boong-Do. I don’t know how it gets better with each episode but this drama does. Today we got one important answer and several pertinent questions asked. Hee-Jin wanted to know Boong-Do’s intentions and she got her answer. 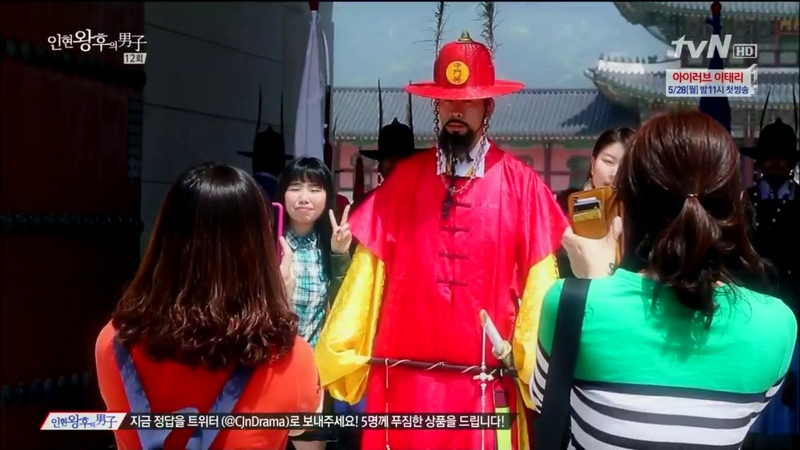 We now know for sure that Boong-Do plans to travel back and forth to see Hee-Jin. But the question that is now on his mind and ours is whether he will make his life here in the future with Hee-Jin permanent. The effects and consequences of Boong-Do’s meddling with history and time travel had not been openly discussed in the drama so far but we now see those questions coming out. Boong-Do knows how history will play out. He knows much more than a person should. His life in the past, then, is just watching everything play out in front of him. How can someone live his or her life like that? The easy answer would be to say that Boong-Do could just live in modern time with Hee-Jin. But the writer throws us in for a loop and reminds us that there is a balance to the amulet. “He lives when he dies. He dies when he lives.” Boong-Do lived for the sake of trying to reinstate the Queen. When he traveled through time, he wasn’t doing it solely for his life or happiness. But now it is a different story. Boong-Do is trying to live and is searching for his own happiness. The great looming question then becomes whether that means death for him. Just when I thought that maybe the Joseon and time-travel part were starting to lose their significance, the writer once again raises the stakes. Now that’s a good drama. KEEP IT COMING!!!!!! The moment when she pretended to throw the talisman and BD got scared and serious…..HJ’s reaction……. gah, my heart. And the last scene? Why so adorable and natural? Cut scene thanks to bubblybrook from YT for the cut! And where is the chocolate feeding scene from the pictures? The walking through the river and the scene where they are walking at the train tracks? I hope they didn’t cut these scenes, hope HJ remembers their date again and more cute scenes are show to us 🙂 or maybe they are just showing us In Na and Hyun Woo having a good time, maybe even getting their own date… lol I’m wishing too much! Thanks so much Joonni for the recap!!!!!!!!!! I love, love, love your recaps as much as I love this drama. Thank you. I appreciate the time and effort that you have put into this amazing recap. I really enjoyed the courting lessons that we mere mortals can only contemplate and then and sigh wistfully. But at least we can laugh thanks to you. I think…. YW is going to do something with the amulet. We didn’t see JS destroys the amulet. But when BD is hit by the arrow he does not vanish which implies something is wrong with the amulet. Hmmm. Something about YW expression bugs me when she talks with the monk. It seems like a foreshadowing to amulet. I don’t think the writer will simply ignore YW character. The fact that she has an unrequited love with BD shows something there. Am wondering about YW too. She refused to marry BD because of the class difference when he suggested it. So she knows that there is no future for them. She is too much of a catalyst to be dumped by the wayside. She could be killed off as part of revenge strikes, or BD could taker her to a world were “entertainers” are worshipped to pieces. I really wouldn’t like to have YW hanging around in 2012 though. Imagine how jealous HJ is going to be if BD were to bring along another woman. Hah. “Imagine how jealous HJ is going to be if BD were to bring along another woman. Hah.” LOL I love jealous Heejin, awesome idea. I have a feeling BD will bring YW to the present times(2012). I remember that he asked BD to bring her to the world where there are no class differences if there is really one. 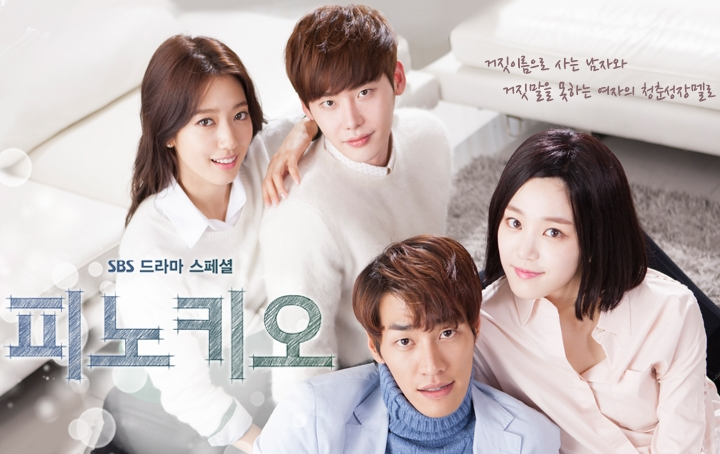 I was so impressed with Ep12 I couldn’t wait, I went to talk about it at your Ep11 recap. Oh, how silly me. But how come a drama this PERFECT? Each episode surpasses the previous one. I love the lingering questions in Ep12, love every sweet moment of our couple. Ep12 was surprisingly balance bw the romance and the angst, while there was no fighting scene this episode but we see danger coming, and we don’t know the consequence of it. Ep12 was deep, in both romance and the meaning of BD’s time-travel. I didn’t tell you but I also recap QIHM in my language, without your recaps I can’t do full translation. Your recaps are my guide, my joy, and my love in this QIHM heaven. THANK YOU JOONNI, Hwaiting! The beautiful balance of episode 12 had me really mellow after the episode ended. Glad to be of help. Hwaiting on your efforts too! YAY!!!! sez me….I love, Love, LOVE everything you write and the way you phrase it…and the asides too! * I kinda feel sorry for Dong-Min (I know, I know….) He’s being a royal butthead, however it’s neccessary for us to see him in that light, because he DOES have a really cute prankster side and if the writer doesn’t find a way to *turn us off* to him…he will remain a viable love interest. *Cannot for the life of me figure out what the writer intends to so with Yoon Wol. She’s clearly been pining-away for Boong-Do for ages, plus she is the catalyst (talisman provider) AND….she’s at constant threat to become a pawn for revenge. Sigh. She’s so lovely, yet so pitiable. Maybe she can accidently be pulled into the future with Boong-Do, but it’s Dong-Min who sweeps her to safety/love. Yeah…far-fetched, but I would like to see a happy ending for her sad little face. * Minister Min. Can someone please just hand him the bowl of poison already? Dude is getting on my last nerve with his mustache twisting evilness. Thanks again and CHEERS to everybody! I don’t think Dong-Min is completely detestable but I just want to dislike him. He is such a BIG baby. Since I can’t keep my imagination from creating scenarios for dramas I love, I think Yoon Wol will eventually be swept into the future to live an independent and respected life. I’ve even figured out her career, she will compose beautiful gayageum music for dramas and win many awards. ooooo. nice. I vote for this…but with someone to love her as well instead of a lifetome of one-sided love. Gisaengs are actually one the most educated women in the Joseon era, learning the musical and literary arts. So YW probably knows how to read and write, unless all she did was learn the gayageum in her training. Joonni, thanks. My mistake. If she was the top gisaeng in the capital, that would make YW highly educated then. Just thinking that she was a slave girl until KBDs family was eliminated, so can’t have been a gisaeng too long. Shi, I was thinking about that myself. Carre is cute now. After KBD has been in this world for a while, it will just be stupid. HJ, go to Joonni lesson 9, NOW. 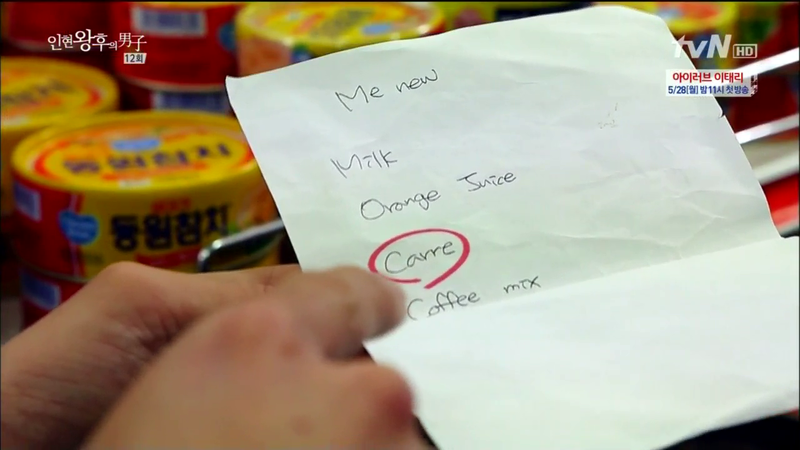 Lucky for Hee Jin the supermarket guy didn’t catch her “Me New” on top of her shopping list or else it’ll become a double whammy…. Lol Jezzy. Didn’t notice that :D.
love it… love it… love it so much! I think we should know how that amulet work. He has to be between life and death to go to the future( that’s the way that amulet work). Remember, when he in Jeju and get attacked by Min Am peole, they can hurt his head using arrow. So, i guess they just try to hurt him, not kill him instead. to make him die coz loss of blood. it’s my tought. That’s my favorite type of drama. Watching people fall in love. Oh my, the angst. We just got a tiny taste of it in this episode (episode 9 was actually really ok compared to this), and I already felt sick. I think we will be 😥 in future episodes. Can't believe there are only 4 episodes left, boo hoo! And speaking of bullies. HAN DONG MIN IS WORSE THAN COW DUNG. Oh. My. Wha?!?! Do people like that EXIST? I can't even begin to explain how badly I hate him. I mean, I have no words. He's so disgusting. And saying that he is childish is no excuse for his behavior. EW. Agreed. HDM is just bad boyfriend material. Episode 1, he almost exposed her changing clothes to the audition staff-no respect of women. If things go his way, he is boyishly cute. If anything is off, he turns petulant, belligerent, abusive and violent. Headlock games? Really? Hello Joonni, thank you for your fast recap! I have a question about how they call each other – Boong Do isn’t call her “lady” anymore, right? So how does he call HJ and how does he call him? Also do they talk to each other in jondaemal or banmal? Thanks! He doesn’t refer to her as “lady” anymore. He just doesn’t call her anything when he is talking to her. He mostly uses the formal traditional version of “you.” But he does call her “Choi Hee-Jin sshi” when he is talking to Soo-Kyung. They still speak jondaemal to each other. Thank you so much for recap! I just watch it with your translations. It’s a great help. will this drama ended happily ever after? will bung doo sacrifice his Josoen life to be w/ HJ ? 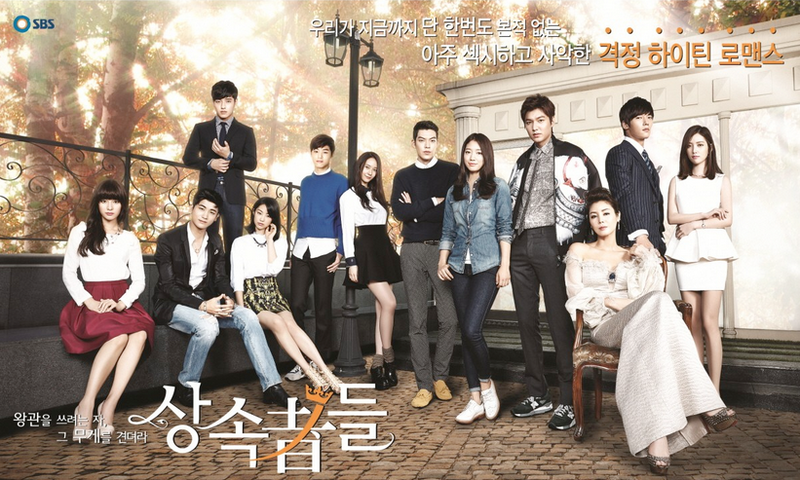 Gosh, i hope the ending is different from RTP. We need Bung Doo in modern era. I watched it raw of course because waiting for subs is too hard and too long, and now I can understand what they were saying! I really loved so so so much the fact that you respect the order of the events during the episode and that you translate the most important conversations as they were said! Why am I getting a bad feeling about her narration at the end of the episode? “…and its end, were heading towards us.” Ohmygod. It feels like something baad will happen. Bad thoughts, leave me alone. I love how this episode was balanced. And seeing Boong Do making choices worries me. Time traveling back and forth isn’t easy for him. He needs to risk his life in order to go to 2012. And then there’s Ja Soo and Minister Min plotting to kill him, and maybe, frame him too. Jooni, I love reading your recaps, no matter how it gets longer. King SK’s woman? New drama. Hi guys, so, I’m worried. Every time a character does a voiceover, makes me nervous. It means the character is telling us a story. The stories can be either happy or a sad one. Why she tells to us viewers how she met BD? Lesson no. 1 for the viewers : never put food in the stove while watching the show! it will burn or you will need to pause every 10 min. I think we must have a poll to find the best recapper for this drama. Between you, maymay@maymaywatch.blogspot and dramabeans. But for this episode, you are the best! I SUPER LOVE THIS EPISODE. P.S. Red seems to be a color of our couple? First, the phone booth. Then, the bike’s red, too. I wonder if it has a meaning? No wonder Heejin glows like a light bulb. tarianant, I couldn’t agree more. The actors height difference really makes an impact here. You see her raise her head to speak with him, and he bows to listen to her.. Beautiful. This drama has seriously butchered any delusions I had of ever getting my “happily ever after.” Sigh. Why is Boong-do so perfect??! I think it’s interesting how they’re bringing in his reluctance to not permanently stay as a conflict to the plot. That is, without him knowing that his staying in the future (present?) could potentially mean his death. That’s gotta hurt on Hee-jin’s behalf. Heh! I was joking to my sister last night that Boong-do is so perfect that he’s ruining me for men in real life. Haha. Same here, except I’m not joking! !